Transitioning from an earlier edition to Issues and Science: Designed for the NGSS? Select I AM A CURRENT SEPUP USER in the dropdown below for a Second Edition disciplinary sequence. 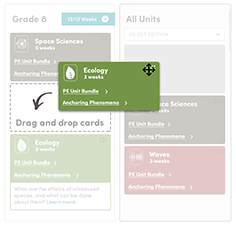 Adjust units for your current scope and sequence, then drag NGSS edition units to match. If you have selected a state, we have already built a scope and sequence for you using your state’s standards and SEPUP’s correlation documents. Customize it by selecting and dragging tiles between columns or from the Units list. Units cannot be broken apart without disturbing the unit story line. You may note that some standards are recommended in a different grade from the state in order to maintain the unit's integrity. * Estimated number of weeks based on field testing. Actual instructional time may vary. † Units still in development and subject to change. Lab-Aids has prepared a number of correlation documents that demonstrate how our middle school programs are aligned with your state's standards, Common Core ELA and Math, and the NGSS. To save the curriculum you’ve built, complete the information below. You will receive an email with a link to your custom middle school curriculum. This information is also shared with the Lab-Aids curriculum specialist for your state so that they may be best prepared to assist you should you need it. To avoid inadvertently contacting students, we do not respond to personal email accounts. Do you have an Administrator or teacher that should see this? Summary sent to your email! How can engineering be used to improve the lives of those living with medical conditions? How do different types of force fields help us design transportation? What is the environmental impacts of producing, using, and disposing of materials? How can we reduce the risk of motor vehicle accidents? How can people manipulate energy transfer and transformation to use energy more efficiently? How does the weather affect people and how do people affect the climate? What kind of future space missions should we fund and conduct? What are the effects of introduced species and what can be done about them? Where should we store nuclear waste? Which areas of Boomtown are the best choice for construction? What are the ethical issues involved in using genetic information? How do we know if a medicine is safe and effective? How should we prevent the spread of an infectious disease? What does your community do to make its water safe to drink? Whose responsibility is it? Is the growth of Sunbeam City affecting its weather, atmosphere, and water availability? What kinds of future space missions should we conduct? Would a different type of calendar be better? If so, why? Which site would you recommend for storing nuclear waste? How do diamonds produced in a lab compare to diamonds mined from the Earth? Why aren't our plants growing in the school garden? Which areas of Boomtown are safest for construction? What can the introduction of a new species do to an ecosystem? What can you do to reduce the risk of catching an infectious disease? How can waves be hazardous to your health? What are the trade-offs in deciding whether or not to save endangered species or to re-create an extinct one? How should hazardous materials be handled? How are new solutions developed for problems in life science? When you buy a new product, do you think about what materials it's made of? What will happen when you no longer have need for it? How do our choices affect our health? How should drugs be tested to make sure they are safe and effective? What energy improvement should a family invest in to make their home more energy efficient?